Georges St-Pierre may be done as a middleweight already. 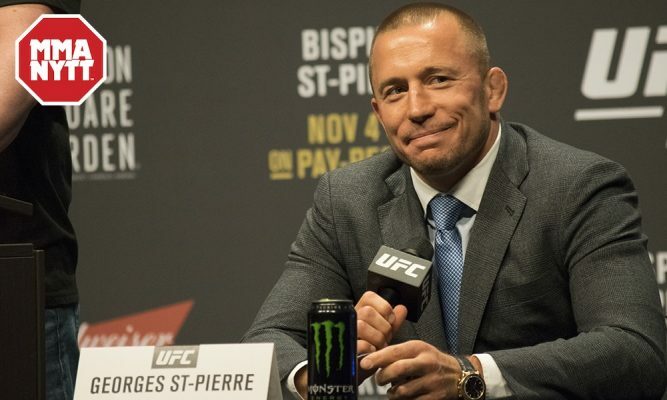 Almost exactly one month to the day after he defeated Michael Bisping to become UFC middleweight champion, St-Pierre is doubtful that he’ll ever return to 185 pounds. The news comes just days after UFC president Dana White revealed that St-Pierre was hit with a bout of colitis, which is a disease in the colon that causes inflammation, abdominal pain and diarrhea. St-Pierre didn’t exactly say that his colitis was caused by the diet he endured to pack on weight to fight at 185 pounds, but he wasn’t denying it either. “Of course in terms of weight, if I want to go back to compete at 185, obviously eating like I did what I did, I learned from my mistakes. I don’t think it’s a good thing to do, force myself to eat, to gain muscle mass,” St-Pierre said. “I’ve always been against performance enhancing drugs and I did the natural way. There’s no easy way. I did it the hard way and it was to gain weight and to maintain my muscle mass, it was very hard. It was not healthy. With St-Pierre already casting doubt that he will fight at middleweight again comes news that the UFC has been in very early discussions to potentially put together a title fight between interim champion Robert Whittaker against Luke Rockhold at UFC 221 in Australia. At this stage that fight is still in the discussion stage, which means it’s far from a certainty but if St-Pierre is no longer planning to fight at middleweight, the matchup between Whittaker and Rockhold could allow the UFC to move forward with the division as early as February. Obviously no final decision has been made on St-Pierre giving up on the middleweight division or Whittaker vs. Rockhold being booked, but both seem possible right now.